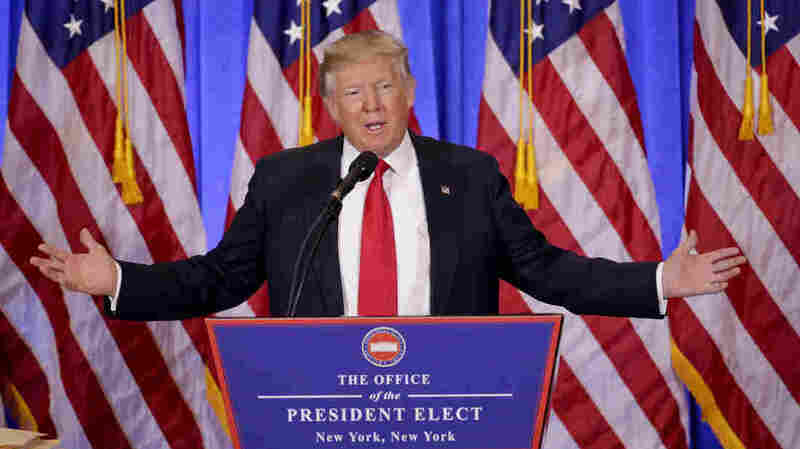 Trump Press Conference: His First As President-Elect With Transcript And Fact Checks Donald Trump held a news conference in New York on Wednesday. NPR's politics team, with help from journalists across the newsroom, live-annotated his remarks. For the first time in 167 days, President-elect Donald Trump held a wide-ranging news conference. NPR's politics team, with help from reporters and editors across the newsroom, live-annotated the speech. Portions of the transcript with added analysis are underlined in yellow, followed by context and fact checks below. Note: The transcript was updated throughout the press conference. While we are working to correct errors, it may contain discrepancies and typographical errors.